When looking for a job, it’s easy to discount having a personal relationship with a recruiter, but nothing could be further from the truth. Having a recruiter notice you and look out for your interest can be the fastest and most effective way to network your way into a new position. Filling out a job application is required, but in no way should it be your first step with a recruiter. Get in touch with the recruiter prior, then they will probably request that you apply online. If you just look like another applicant following up on some resume you submitted awhile back they will ignore you. So what websites are good for this process? Linkedin is probably the best. Twitter and Facebook may be cute, but it won’t land you that perfect job. Fill out your LinkedIn profile completely, be honest, and network with experts in your field of study. Over time, LinkedIn should pay off for you. Some other job board are horrible excuses for real career networking will only reward you with spam. Although LinkedIn will be your main lifeline, don’t forget to use the phone. If you see a recruiter’s phone number on LinkedIn and you match what he/she is looking for, don’t be afraid to give him/her a call. 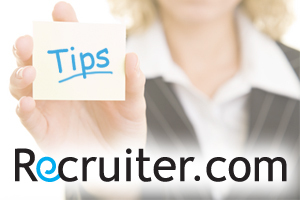 Probably the most important way to meet and get to know a recruiter is through live events. There are tons of conferences, summits, meetups, even bars where corporate recruiters are at on the regular. Figure out where they are going to be, get invited, and go bold and prepared. Instead of just trying to convince them that you are the best talent of all time, get to know the recruiter – their clients, their strengths, and past placements. At job fairs, tailor your resume so that it is easily read and also make sure that it is exactly targeted to the profession that you are aiming for. Recruiters meet a lot of people so your resume must be clear, but also memorable. This will allow you to reference skills and experience easily while providing anecdotes to show why they need you. When on the phone, notice the recruiter’s voice, tone, and volume. If a recruiter is energetic, show great energy and enthusiasm. If he or she is soft-spoken, talk to them in a similar manner. If you look to develop a relationship and real comradery with the recruiter, you’ll be the first candidate they think of when they receive a search assignment. Don’t be afraid to ask them direct questions which involve not only the steps to hiring at the individual client, but also about the recruiter’s personal experience with that client and what they have noticed about their hiring and work practices. If you do these things, you will build a real relationship with a recruiter, which is infinitely more valuable than sending out a million resumes to every company you can think of. (Although, that approach might still be a good idea as well.) As you want to be personally considered for jobs, give a recruiter your personal attention and you may develop a “career lifeline” that will serve you well throughout your career.